At the Mathematical Competition in Modeling (MCM), teams from Central Washington University earned rankings in the top 10 percent of more than 6,700 universities and colleges from all over the world. Both CWU teams earned a Meritorious ranking—one of the highest honors teams can receive. CWU was one of only three schools in the United States in which all the teams were rated as Meritorious. The MCM is an annual international competition, with teams of three students developing and analyzing mathematical models to address real world questions. This year's competition had a choice of two challenges. In one, the team would develop a ranking for college coaches over all sports and time periods. In another, the team would develop a model for traffic flow determining whether or not the keep-right-except-to-pass rule is useful. The two MCM teams chose different problems. The team of John-Paul Mann, Nathan Minor, and Benjamin J. Squire chose Problem A, the Keep-Right-Except-To-Pass-Rule. Adam Brand, Albany Thompson, and Nathaniel Deardorff chose Problem B, College Coaching Legends. Such problems are exceptionally difficult, because of the inherent vagueness of “best” or “useful.” As a result, there is no single right answer for these types of problems. Teams are judged by the cleverness of their model, as well as how well they communicate their model and its results in a written report. The MCM competition lasts only 96 hours: from 5:00 p.m. on Thursday until 5:00 p.m. the following Monday. Teams must work almost around the clock to develop a model and to write a report. This year’s competition was held February 6-10 and judging was completed in March. The results will be posted on April 29. The MCM is sponsored by COMAP, the Consortium for Mathematics and Its Applications, an award-winning non-profit organization whose mission is to improve mathematics education for students of all ages. Since 1980, COMAP has worked with teachers, students, and business people to create learning environments where mathematics is used to investigate and model real issues in our world. 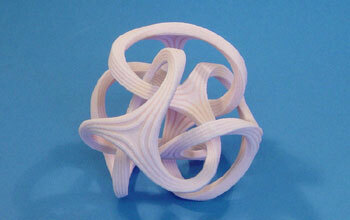 Image of a mathematical model courtesy of the National Science Foundation.